154 Hidden Court: What might have been. R and I took the boys to a local festival/carnival deal the other night, and on a complete lark, we decided to drive Hugh. We don't do this nearly enough, because the truth is he's just not practical to drive when you're lugging around car seats and children and all that entails. But we worked it out, and the result? Totally worth it. The weather was beautiful, the top was down, the radio - an actual radio, complete with stations that come and go and scratchy sounding speakers and a tuner that only seems to pick up country or oldies - was blaring, Hugh was shiny and red, and it was a lighthearted ride that put all four of us in a great mood AT THE SAME TIME, which is so rare it is nearly inconceivable. 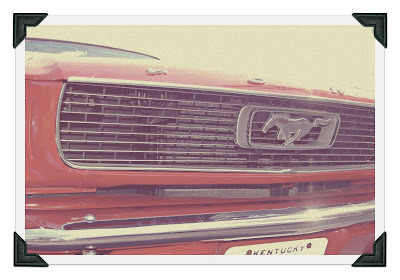 Anyway, as we were driving along we came up behind one of those car hauler things - not a wrecker, one of those flat bed deals - and on it was a car that was so decrepit and rusted and beat all to hell that it took me a few minutes to register that it was a '66 Mustang, just like Hugh. They were car-brothers. Twinsies, almost. Except for the fact that Hugh was as bright and shiny and red and growly as the day he drove off the assembly line and this other car... wasn't. He wasn't even drivable. I'm not even sure he had wheels. Or an engine. Or anything other than just the shell of his former beautiful self. I felt so, so bad for that poor car. I couldn't take my eyes off it. As we sped up and slowed down and sped up again like you do in traffic, I kept craning my neck this way and the other to try to get a better look. I think the guy driving the truck thought I was checking him out, which must have been weird for him considering I was with my entire family. I know I tend to be nostalgic about old things - old cars, vintage dishes, old family photos, whatever, but as I drove along in my beautiful car with this worn-out, run down mirror image of it riding along side us, I couldn't help but think about how glorious he used to be, and to hope he would get a chance to be again. Although my practical nature told me he was probably destined for a junk yard compactor somewhere, I couldn't help but hope that he was on his way to a collector - a lover of old cars - who would restore him to his former polished brilliance and give him the life he deserved. Because even though his life had been tough, and he had been beaten down by his circumstances, there was still so, so much potential left inside him. All it would take is just one person to notice and care, one person to see the possibilities, and he could be back on the road where he was meant to be. So good. Everything (er, everyone) with a difficult past deserves an opportunity to become shiny and new again. On another note, '66 Mustang? So jealous! I love cars; my husband, notsomuch. Exactly! Second chances for everyone! Or third chances... or fourth. Some cars... and people take longer to find their forever place, ya know? And yes, my 66 Mustang and I are super close. I have loved old cars my whole life, and now I finally have one to call my own.